Anyone who has read 'I Too Had A Love Story' by Ravinder Singh and was touched by it, would definitely pick up the author's second book - Can Love Happen Twice. We all have some expectations from an author whose work we appreciated. But, many a times all those hopes fall flat when the author's work doesn't meet our expectations. Let me tell you why I say so. Here, I can't help but draw a comparison between the two books of the author.The first book was based on a true story, the author's own love story. Not that the writing style of the book was great, but the story touched the heart of many, for its simplicity and honesty. For all the author had been through in his life, the readers felt empathy for him. 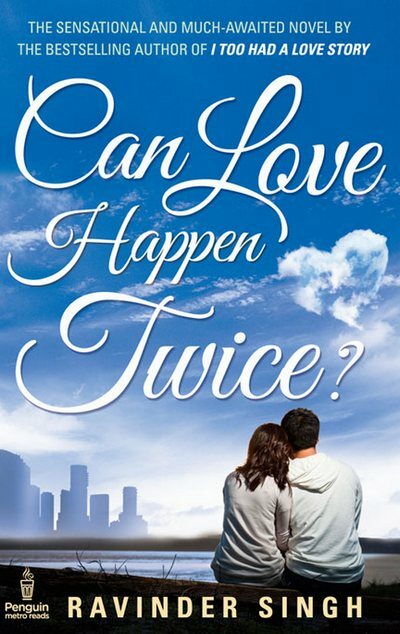 In the second book - Can love happen twice, which is a work of the author's imagination, he has tried to sell the old-stale-love-story in a new packaging. Plot is simple. Boy is lonely and trying to live with his past. He goes abroad for work. Sees an Indian girl. Falls for her. Love happens. Boy is back to India. Trouble starts. Suddenly, career is more important for the girl and she breaks up with him. Boy is broken and gets mental. He runs to the street and meets an accident and hence, ends up in a rehabilitation home. And guess who is telling us this story? His three friends reads his unfinished book on a radio show! The problems doesn't end with the plot, the characters are also very poorly sketched. The character of Simar is irritating, melodramatic and irrational. She is nothing like the character of Khushi of 'I Too Had A Love Story'. The love portrayed between Ravin and Simar is more of an infatuation which fades with time. To top all this, the author keeps bragging about being a best selling author through out the book. Looks like the success of his debut novel has got into his head. If he thinks that he can sell any crap for a love story, then he is wrong. This book doesn't work for me. If you have read the author's first book and liked it then, please don't pick up this one. It will ruin your empathy for the author. I don't think I am going to read any more of his work. That is, if he decides to write another book. You can surely give this one a miss. I was so looking forward to ths book Jyoti ! glad you posted the review.. Thank you for this perfect and unbiased review, Jyoti. Thank you for this perfectly unbiased review, Jyoti. Very well said jyoti ! N yes simar's character ws really melodramatic..she wsnt at ol like khushi..
Dis book ws juz a waste ! Yes jyoti I completly agree ! Very well said..i too hd a LS ws d bestest novel I hv ever read..i had much expectations for dis one too.. But it wsnt dat nice..rather disappointing ! N yea Simar z really melodramatic character .isnt at ol like khushi !! Yes jyoti, I also felt same. Simar is just opposite of khushi. Khushi was so simple cute and simar is so dramatic. Lots of expectations but disappointed. I read his 1st novel in just one night and now i am just going to read for his 2nd one but thank u for your review which made my mind to not do this and break my empathy for the author.